I've always taken a liking to that song, so alas, i might as well take a liking to sharing some pretties i have found!! 1. "Remember" by Geninne. These colorful drawings are absolutely amazing! 2. "Cherry Baby" by Jen Nale. This plate is right up my ally! Can anyone guess why? 4. 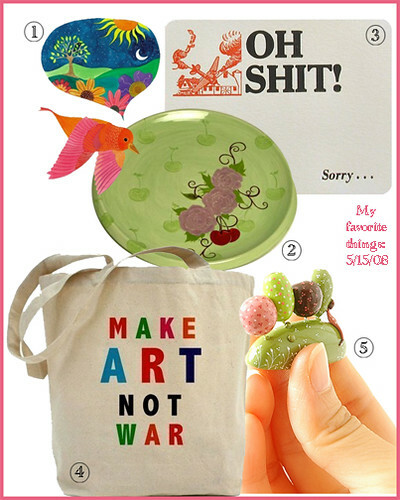 "Make Art" by Melissa Vest is a bag everyone should carry! 5. "Into the Woods" by Eva Soehjar. Her style, her jewelry, every things adorable! In "Bags", "Cherries", "Greeting Cards", "Jewlery", "Painting", "art cards", "birds", "etsy", "glass handmade", "hand crafted", "hand made", "plates", "plateware", "tote bags"